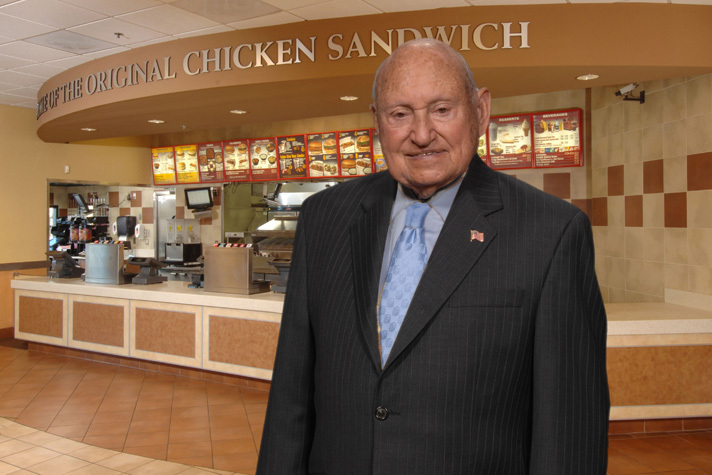 Truett Cathy's faith impacts every part of his life, including his business decisions. Photo courtesy of Chick-fil-A. Truett Cathy, founder and chairman of Chick-fil-A, Inc., believes that business people can be honest and successful at the same time. Read an interview that first appeared in the October 2002 issue of Decision Magazine. Q/ I understand that since childhood you have used Proverbs 22:1 as your life verse. Why did you select that particular passage? A/ I memorized that verse, “A good name is rather to be chosen than great riches,”(1) in elementary school—which was a public school. Students were required to bring a Bible verse to homeroom on Monday mornings, and one student’s verse would be selected as the verse for the week. With help from my mom, I selected Proverbs 22:1. I’m always conscious of keeping my name in good order. Doing that, I believe, has been paying dividends for me even now, because in the restaurant business we have to do things right each and every time, not just sometimes. A person can have a pleasant experience in a restaurant 50 times, be disappointed once and never go back. What we say is important, but what we do is more important. Q/ How have you been able to integrate faith and business at Chick-fil-A? A/ Sometimes people ask if they have to be a Christian to work at Chick-fil-A. I say, “Not at all, but we ask that you make your business decisions based on biblical principles.” There seem to be no conflicts when we tell people of various faiths how important it is to stick to the Scriptures in business decisions. In the Scriptures we learn how to handle our businesses, how to give customers good service and how to treat employees. I believe that being in the restaurant business is an opportunity to serve people—their physical and emotional needs, and sometimes their spiritual needs. A lot of people come out to eat who aren’t even hungry; they’re just looking for a pleasant experience. We believe that God is glorified in the service that we render. We inscribed that motto on a large plaque and placed it outside the entrance of the building. It’s a constant reminder to me of how I need to conduct myself each day. Q/ You’ve put your faith into practice with your policy of being closed on Sunday, a big business day for fast-food chains. A/ That’s a decision we made 56 years ago, and it’s probably the best business decision we ever made. At the time I did it because I was in the habit of going to Sunday school and church and being with my family. I didn’t want to be robbed of that. It was easy to make that decision, because our first restaurant, the Dwarf Grill, was a small place with four tables and chairs and 10 stools at the counter. We worked 24 hours a day, six days a week, so it was easy to decide to be closed on Sunday. Our Sunday policy has been a great advantage in attracting the caliber of people whom we like to attract. People are responsive to this—they may not attend church, but they appreciate that we stick to our convictions. Q/ You founded your business in 1946 with the Dwarf Grill, but it wasn’t until many years later that you invented the Chick-fil-A sandwich. In those early days how was your faith tested? A/ For about 10 years I had two restaurants, and I often thought, “I wish I had just one restaurant!” So when one restaurant burned to the ground, I asked, “What’s next for Truett Cathy?” Chick-fil-A was born out of that experience. I always wanted to offer chicken, but because chicken took too long to cook, we built our business on hamburgers and steaks and on an extensive breakfast menu. But deboning the chicken cut cooking time in half, and because it was easiest to debone breast meat, we concentrated on that. The seasoning we used was a combination of all the seasonings we had in the restaurant. We found that it was pleasing to everyone, and chicken sandwich sales began to exceed hamburger sales. When we introduced those chicken sandwiches to other restaurants, we lost control of the quality, so we opened up the first business under the name of Chick-fil-A in Atlanta. Q/ Your early years were spent in the throes of the Great Depression. How did those years affect your life? A/ In the early 1920s my father lost our farm, and he never really recovered. My mom was the breadwinner for the family, and that meant she worked a lot on Sundays. But, as often as she could, she listened to the radio broadcasts of Charles E. Fuller and she always made sure we were clean and ready to go to church on Sundays. At age 12 I became a Christian, and I was fortunate to have Sunday school teachers who were meaningful to me in my life, because I did not have a supportive father to whom I could go with problems. For a time we lived in government-supported housing, and I would go with my Sunday school teacher around the housing project to recruit class members. It was with my mom that I learned how to shell peas, shuck corn and go shopping. When I was eight years old, I realized that I could make a profit by buying six sodas for 25 cents and sell them to neighbors for five cents a piece. I generated enough resources to buy a full case for 80 cents. This was big business for me. The first thing I bought was a bicycle for $4.00. I have never bought anything else that I have appreciated more. Q/ What are some ways that you have continued to put God first in your life? A/ Our Corporate Purpose is one of the ways in which we put God first. I also try to live a balanced life. I’ve always been active in churches and have taught Sunday school for 47 years. Q/ How do you tell others about your faith in Christ? A/ I find many opportunities to communicate my faith. Many times, such as when I’m on an airplane seated next to someone, something happens that brings up the subject of faith. We all have opportunities that we need to take advantage of. I founded a program called WinShape Homes for orphaned and abandoned kids. We have 12 foster homes with 125 children. I am the adopted grandpa for them. We bring the children to Sunday school and church and midweek prayer meetings. Many of the children have come to a saving knowledge of Jesus Christ. Once a caseworker called me about three boys who needed a mom and a dad, but at the time we didn’t have a place in our foster homes for three boys. They spent the weekend with us. Their ages were 12, 14 and 15. The first thing we did was to eat. Then we went shopping. Then we ate some more. Back at our home we read the third chapter of John, and I explained briefly what it meant to be born again. The next day I asked if they had thought about becoming a Christian. The two older boys said that they were Christians, but 12-year-old Nicholas said, “Well, I’m not.” I asked him when would be a good time to accept Christ, and he said, “Right now!” So there in the car we bowed our heads and prayed. Q/ What things are you the most thankful for? A/ I’m 81, and this has been the most exciting year of my life. In recent months I’ve been asked to be on NBC and CNN, and have participated in the President’s Economic Forum. I’ve talked with our country’s political and business leaders about how to run a business based on biblical principles and to be successful. Also, I have written a book, “Eat Mor Chikin: Inspire More People,” which deals with applying biblical principles not only at work but also in life. God has been good to me. He has enabled me to help and inspire other people. It’s gratifying to be able to enjoy some of the dividends from our early days. I want to keep my priorities in the right order and remember where my strength comes from. (1) Proverbs 22:1, KJV. (2) 1 Peter 5:7. (3) Hebrews 13:5.